And it doesn’t seem to be getting any simpler. Each day there’s a new distraction vying for our attention. A different shiny object begging us to take it out of its case and play with it. We wear our 80+ hour work-weeks like a badge of honor. We love to tell everyone how busy we are because it makes us feel important. Or we just think that’s how it’s supposed to be. Until I decided to change. I couldn’t take it anymore. I had to start completely over and change everything. I wanted to live more of my life and I didn’t want to sacrifice another moment. One problem. I didn’t know how to do that. I was still wasting lots of time and working inefficiently. It’s what I knew. So I went on a quest to change that. Free Bonus: Click here to get access to a free PDF report with the 24 simple tools & resources that I use to dramatically increase my productivity each day…it’s 100% Free! After reading enough personal productivity books and blogs to choke a great white shark, and trying them out in my own life, I found a combination of bits and pieces that fit together beautifully. This (simple) productivity system is how I manage my months, weeks, days, and even hours to accomplish a lot in little time. I wish I could say that all of this came easily but the truth is, this system came as a result of hundreds and hundreds of hours of experimenting and lots of pain. Today I’m able to get more done in under 17 hours than I would have been able to get done in 40 hours in the past. Heck, I’m able to get more done in one week than I could have done in months before. I’m able to handle multiple projects, clients, companies, websites and have true work-life balance. I spend time with my family, I work out, I walk in the park, I mentor people, I meditate and get to do a whole lot more. Each day. And this came simply making a decision, having a system and staying committed. One thing that I have learned is that if you put time into planning and being very clear about what is most important in your life (for the big picture and day-to-day), everything else is easier. You can work a lot less because you are truly working smarter and clearer. Dream It. What do you really want from life? What are your goals, dreams and ambitions? If you don’t know, none of the rest of this stuff is going to matter. Dump It. Get it all out of your head and onto paper. Clear your mind so you can truly be productive. Map It. Use a mind map to create a simple system to manage your overall goals (both big and small picture). Chunk It. Harness the power of a Japanese productivity technique from the 1940’s and a simple kitchen timer to break everything down into simple, visual tasks. To set the context, I’ll state the obvious – all of us have the same 24 hours in each of our days. What they choose to go after and how effective they are at it. Simple, isn’t it? Are you up for being extraordinary? The first step is to set up the big picture, the context of your life. To do this, start with your ideal life. When I first did this, I was at a point in my life where every single aspect of it was about to change. They had to. A lot of the things that I put down seemed impossible, but that was ok. To avoid drowning in details, I based it on on a One-Page Plan system that I learned from Marc Allen. For each of my major goals, I set up a simple one-page plan. This self-imposed page limit forces me to abstract to the most important top-level details. You may be asking now, “How do I know what goes into that one page and what doesn’t?” Since I don’t know what your major goals are, I can’t give you a specific list. However, here are some useful questions to ask yourself. If I forgot this element, would I still reach my goal? If not, you should probably include it. Is this a specific implementation approach? If yes, consider excluding it, putting it in a lower-level document or tool. Is this a specific task I need to do? If so, it likely belongs in a lower-level document or tool such as a calendar, to-do list, etc. Something very important to remember here…. There’s a good chance that a lot of this will change. I don’t think for a second that I can predict what is going to happen in five years or even next year or next month. I simply have a clear goal of where I want to be and who I want to be and then simple plans to help guide me there. Something else that’s really important to remember here… Don’t worry if you can’t fill in all of the details for any of your dream goals. For some of mine I simply have the goal down and that’s okay. I don’t know how I am going to get there but I know that the plan will be revealed when I’m ready. Always keep your mind as bright and clear as the vast sky, the great ocean, and the highest peak, empty of all thoughts. Human memory is a survival tool, not an existence tool. We remember most easily things that really matter to us. Minutiae of every project or goal we’re involved in – not so much. This means that keeping all these details in our memory exacts a toll on us. It causes anxiety and stress. Clear your mind. Set yourself free – dump it all into a physical notebook, Google Doc, or whatever you want it. Write it down and get it out of your head. The space this opens will do wonders for your ability to focus on what you’re engaging in, letting you stay present in the moment. Now that you’ve cleared your mind, it’s time to organize your own five-year one-page plans into detailed strategies and tactical details. The theme here is to organize, divide into projects, and set in motion the plans and tools to let you conquer each. Don’t worry if you don’t really know how you are going to get there. That’s okay. The details aren’t as important as the destination. By picturing your goals and knowing what your dreams are, you are giving your subconscious mind something to work towards. Think of your subconscious mind as GPS navigation for your car. You put in your destination and the navigation leads you there. At it’s core, a mind map is simply a diagram used to visually organize information. Mind maps can be used for anything from note-taking to brainstorming to summarizing or simply to sort out a complicated idea. I use a mindmap to organize the big picture of what I want to accomplish. This awesome visual tool lets you add new items, delete items, or drag-and-drop items to new nodes. This last part helps if you’re reorganizing your projects, delegated something, or better yet, accomplished it. A mind map is not intended for planning your day, or even your week (at least for me). It’s best used to set up a clear visual representation of everything you’re engaged in. A mind map lets you graphically represent the hierarchy of projects, deliverables, and tasks. You can use font size and color to easily visualize what’s important and/or urgent (more on that below). You can also link to websites, resources, or even docs on your own computer. The visual nature of a mind map also lets you see if any of your projects are overloading you (e.g. too many urgent tasks glaring red at you). By reviewing your mind map weekly, you can see what you’ve completed, which adds motivation for the coming week. If you report to someone else, your “Done” section is a great resource for writing that weekly report. Whether you report to others or just yourself, it’s amazing how good it feels to delete a couple dozen tasks you knocked off in the past week. Click here to get a bonus report with all of the FREE tools and resources I use to make this work! Each Friday afternoon, I review my map for about 15 minutes. I start by collapsing the details down, so I see the top-level picture without being overwhelmed by the details. If I started a new project, I add in its top-level node and start populating its deliverables and tasks. Next, one project at a time, I zoom in to see all the tasks for each of its deliverables, adding new ones based on new developments and realizations. To keep clarity, I delete from the “Done” node those tasks that have been there for the past week, and repopulate it with tasks I finished over the past week. Now, when I clearly see what’s currently important, what’s urgent (and what tasks are both) I can choose which tasks go into my coming week’s plan. GTD is all about storing, tracking and retrieving the information related to the things that need to get done. Kanban is a simple technique to visualize and control your work. Limit your work in progress so you don’t get overwhelmed or discouraged. Using the right-most column of your Kanban for completed tasks is very motivating. As your week progresses, you keep moving tasks from left to right, with each one ending in the “Done” column. Talk about taking pleasure in your small victories! Keeping a Work In Progress (WIP) limit means that if you want to start working on something, you must first finish something you’re already engaged in. This encourages you to finish things, which is the be-all and end-all of extraordinary productivity (well, beyond choosing the right things to do, of course). One possible implementation of the Personal Kanban is as follows. Each morning, I review my Kanban board, move my Most Important Tasks (MITs) from This Week to Today, and once I begin working on move the most important one from Today to Now (which I have as Current Pomodoro). As I complete my tasks, I move them to the Done column, and pull another from the Today column to Now. If I think of something new I have to do, unless it has to be done urgently, I put it in the Backlog column, and on Friday, add it to my mind map. Keep in mind that a personal Kanban is exactly that – personal. Your board will doubtless end up looking different than mine, and that’s a good thing. Think of it as a work in progress. Something you keep improving as you see what works for you and what doesn’t. It’s not just that what works for you will be different than what works for me. As in all things, a bit of common sense goes a long way. For example, with few exceptions, I don’t bother creating a specific task or Kanban card for an email, nor do I do so for repetitive tasks. Instead, I allocate a specific time slot (or several) to handle all such tasks at once (chunk ’em), so they don’t distract me throughout the day. I do the same for any tasks others ask me to do, which are not part of my core projects. This is always a challenge, but it’s critical to minimize how much of my time and focus I spend on things that are important for others, but less so for me. This doesn’t mean I assign those no importance. However, the importance is mostly that of maintaining relationships, as opposed to having the tasks have direct importance for me. Your Kanban board is where you look throughout the day whenever you complete a task, or when you feel the need to pause and reflect on your work flow. Along with your weekly reflection on your mind map, this will keep you on-task, doing the right things, and finishing them. Of course, your process and flow may be such that you need to revisit your mind map more frequently, or less. As with all productivity processes and tools, it’s up to you to find the best way for you to manage yourself. Recommendation: If you want someone who really “gets” productivity and goes deep, I’d highly recommend checking out “The Agile Activist” Paul Klipp. He was a huge inspiration for so much of my productivity work and especially understanding priorities and balance. Wouldn’t it be great if you could have a great day, every day? You can! I share my system for that elsewhere, but the most important parts are simple: Have a plan for the day and visualize success. One-Page Plans, mind maps and Kanban boards are great for the strategic view, and even for tactical planning. But when the rubber meets the road, you need a simple, straight-forward, actionable plan of what you’re going to do today. Not tomorrow. Not next week. Not next year. Today! One of the keys to achieving your goals is your ability to visualize them. So, if it helps, listen to an inspirational song, or put on music that relaxes you, or the opposite – energizes you. Then, spend a few minutes visualizing your day unfolding positively. Finally, go further into the future, picturing where and who you want to be. You might think you can easily complete 12 to 20 Pomodoros in your work day, or 80 each week. From personal experience, that path leads to frustration and overwhelm. What works for me is to define my work week as completing 40 Pomodoros. That’s less than 17 hours! If you don’t make the mistake of trying to cram that into a Monday-Friday 9 to 5 straitjacket, you have 168 hours each week, so you only work ~10% of your time! This doesn’t mean I don’t do anything work-related during the other 90% of my time. I normally spend another 20-25 hours in meetings, on phone calls, networking, etc., but I don’t count those as work time. The interesting thing is that I get more done in those 17 hours of intensely focused work than I used to get done in 80 to 100 hours of a crazed “busy” work schedule. As added encouragement, for each Pomodoro I complete, I make a check-mark on my calendar for the day. At the end of each day I look back and see how many I completed that day, as well as during the previous days of that week. Since I’m committed to getting 40 done each week, I try really hard to complete six to eight each day, so by the end of the week I have the sense of accomplishment that comes from knowing I hit my target. Being human, I’m not always in the best place physically or emotionally to fire on all cylinders. When that happens, I shift my focus. If I feel physically low, I work on my health and wellness. If I’m sad, I do something that makes me happy, like spending time with my wife and daughter. That way I’m always mindful of Stephen Covey’s seventh habit – sharpening the saw. Now that you’ve read this post to the end, I’d appreciate any comment, suggestion, or question you may have. Leave a comment below. Then, get cracking on your own plan. What are you waiting for? Your life is out there waiting! I created this FREE bonus report that will show you exactly what tools, hacks and other resources I use to make this all work. Click the image below and enter your email to get access to this PDF with 24 tools and resources you can start using right away (including my 4 ‘must-haves’). Click the image below to download the report now. Great post Chris! Thank you for doing all the work to come up with this plan. These are some really helpful tips and I look forward to trying them! Hi Chris! How are you doing? I’m not that good at managing lots of things at once (something is always put aside or stays completely forgotten in the shelf until I rediscover it), so I will definitely try your system out. A thing I liked very much in your article is that you also suggest us to try to keep an equilibrium between what we want to achieve and our conditions at the time (not feeling well physically or emotionally tired) by changing our focus, because this also gives me a hard time. Thank you very much for writing this article! Stay well! I’m great — thanks for asking! Such excellent and useful information. I do so enjoy your use of quotes and visuals. Thanks. What resonated with me the most is something you mentioned twice: “I don’t know how I am going to get there but I know that the plan will be revealed when I’m ready.” This is so important for me to remember, for my own negative thinking can tell me I’m never going get there because I don’t know how. So I should not take action. But the plan, as you say, will be revealed. It always has been! Thanks for the reminder and the detailed post! Awesome article, your tips and advice have given me tools to further organize my life. Serious question: How many pomodoros did it take you to write this article? Great question Mark! This thing took me a loooonnngggg time to write — I believe it was just under 60 Pomodoros when all was said and done (including graphics, bonus content, etc). I love the kanaban idea–I’m looking into it immediately! 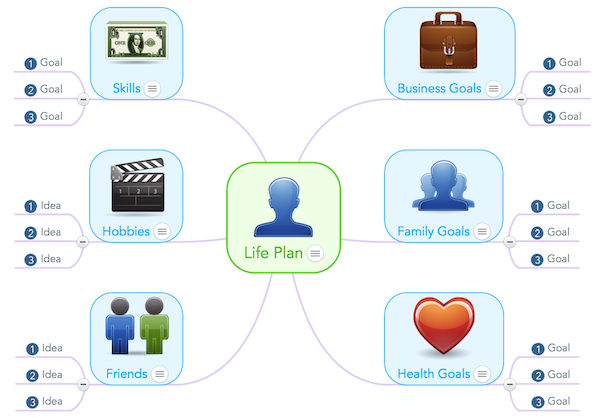 And the mind mapping tool is pretty amazing too. You’ve inspired me to create a big one I’ll put on my wall in my studio. Seeing the path I’m working towards will make me more motivated to reach the end. It is awesome! I use to work with mind maps, and I can say that they are super ultra helpful! I hope receive more interesting articles. Thanks David — glad you enjoyed it and I hope it helped! Chris, thanks so much for this. I’ve just started an internship which is flexi-time and flexi-location, so I am going to try out your systems for having a great day, implementing pomodori, and ‘dream dunk map chunk’. Really looking forward to positive results over the coming weeks. Loved this article – sometimes you need to try a different way of achieving your goals. This approach let’s you get tasks completed and make time for family, friends and community. About seven years ago I set myself a five year plan – and I got exactly what I asked for. Only problem was I hadn’t factored in all the stresses that were involved in achieving that plan, and then life threw a few curveballs too…but the approach in this blog post makes you break things down so hopefully you would be more prepared for the unexpected. Thank you so much for your comment Rebecca! Thanks for sharing what’s working for you Gerome — that’s awesome! This seems like a sensible, thorough system. 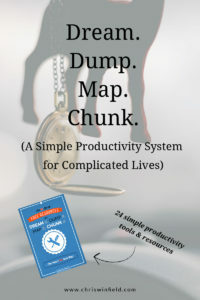 I already use the Getting Things Done approach and Pomodoro to chunk my tasks, but I got inspired by the mindmap idea. Also, I see that it would be quite helpful to review the tasks I have completed in order to take pleasure in my small victories. I can’t wait to implement your system and see how it works for me! Wow, you are on the right track Marisha! Hi Chris, thanks so much for this great article! It’s very rare that I read through a long article, but I was on the search for other techniques for me to get focused and organized. I’ve never heard of the Kanban technique, sounds interesting. I’m going to look into it. I found this article from Twitter. Aloha and have a great day. Glad you enjoyed it Janin! Great stuff Chris! I love this so much because it’s me! I must and will follow these steps.Thanks for putting in the work for us! One of my philosophies has always been you can achieve greatness in a lot of things but it means nothing if you fail at motherhood/fatherhood. Finding the balance is everything! Thanks again! I love the mind map idea. Thank you! Glad you liked it Crystal! 2. What I really want to achieve? 3. How do I meet the strength to commit to start? Keep the good work, Chris. Those are great questions Juan and I think we all struggle with them at different points in our lives. 1) Ask yourself this question first thing in the morning and write down (with a pen and paper) whatever comes to your mind. Don’t censor yourself. Just write. You’ll be surprised at what you find out about yourself. 2) What makes you happy? What makes you feel like you are improving your life? What about the lives of the people around you? 3) Just make a decision. Once you decide, the rest will take care of itself. In relation to the last part of your article, I usually change the type of work that I am doing (exercise, article reading, tangible progress on a specific project) depending on my strengths, as opposed to focusing on what I am feeling weakest in and improving on that.. Sounds like a cool concept though, will try out sometime. Great article. Sounds more like Map/Reduce ( Hadoop ) to me. 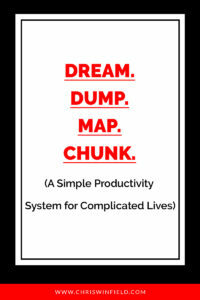 ‘dream dunk map chunk’, wow Chris, really enjoyed and loved reading this post. I just started up a small local education startup and you inspired me a lot. I have just noted some of this points you mentioned here and going to use them. I am excited and feeling motivated. Thanks Chris. I will use that idea of Pomodoro and now take a break, because I already used at least 2 x 25 minutes without break, concentrate to your writing and all that links you shared in your post! Excellent advice. Pretty much my own system works this way. Also the GoConqr.com (formerly ExamTime) is the best tool for keeping it all together and recommend it highly for staying focused and clear with projects of all kinds including work and life management. If you don’t like wasting time, this is the perfect resource to map it and ship it! End confusion and waste: GoConqr! I love this system. My main problem always was that I kept all the things in my head. They are popping up out of nothing at the least important time and consume energy to deal with them. I lately started putting them down in a to-do list but that’s overwhelming because they’re not organized. It’ll take time to implement the things you suggest. I’m gonna start with the life map. Mark down all projects I try to work on, organize it and to review it every Friday for 15 minutes. Nice article Chris! I’ve been a fan of GTD and it’s nice to see that you utilize that system as well. Once in a while I need a refresher to remember that I have a goal in mind and that I should begin again in my quest to be a better person and become more productive. Thanks a lot for posting this. I’m already a productivity freak and I don’t learn new stuff often. But hey—I’ll be trying that Kaban Flow app next week for sure! Love how it integrates Pomodoro. I’ve subcribed to you last week. Will keep an eye out for more. Enjoyed your article on productivity. I have been using a mind mapping software for a while now and I can’t seem to find words to describe how well my effectiveness and organization has improved. Really recommending to readers to take up mind mapping if they want to reach greater productivity. Great post I need to see how it fits in with seeing patients all day it’s a way of organizing other aspects of my life. There is more to being a good doc then just office visits unfortunately with the accountable care act the tasks and documentation is a time sucker. Man, you really make things sound and seem so darn simple. After reading about your own way of doing things I am very inspired to start brand new. I want to live a more fulfilling life and have more time to do the really important things in life. My family is not getting the amount of time, love and attention it deserves and I want that to change quickly. 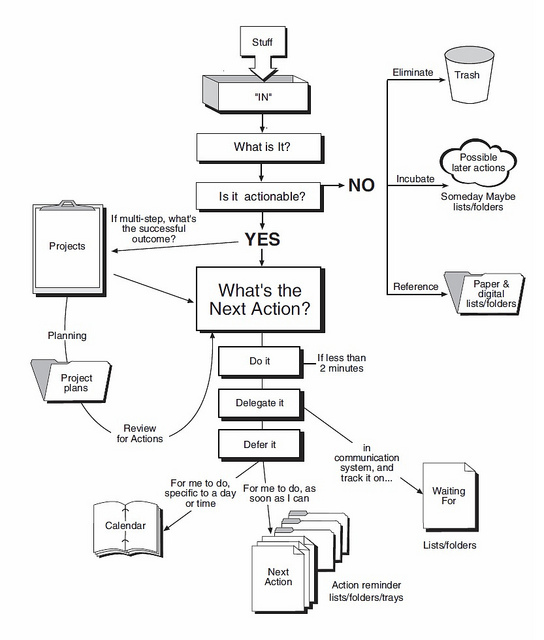 1-What is the relationship between the one page project plans and the mind Map? 2-I assume you keep your inventory of projects and tasks parked in the mindmap until you are going to act on them that week. Correct? If so, how do you move them to Kanban? Re-type? Copy and paste? I don’t recall ever before getting through any productivity article; I simply wasn’t able to keep my focus on the approachs suggested from (respectfully) “another productivity successor”. That’s not me being bitter or a poopoo, if you will; rather, it’s me saying, “Oh my God, really? Just like that, huh? !” And then came Chris. Mr. Winfield, thank you, you held my attention (a major accomplishment from both of us) and made sense. You made sense! And, there’s reality interwoven throughout your article: “it’s not easy; it’s painful, etc.” Thank you for that; rather than describing how “great you are and how simple it was to just do it!” I found myself relating, understanding, agreeing, and learning. In fact, (here it is–>) Oh, my God, you’ve renewed my hope that “Okay, I’ll be able to get it together…”. For me, the recovering Perfectionist, it’s not easy to receive all this without much criticism (I’m my own worst enemy, I know). In fact, this issue is part of the reason for which I landed myself in such procrastination that, even the idea of procrastination-detox is an idea so overwhelming (because of the work I need to address) that the idea, even, has sprung a handicapping anxiety into a chokehold around my throat. So, yeah, it’s painful. It’s not some sugary concept on a website with a “sign-up for my #GSD weekly emails” sung by a bright-toothed sweetheart who I wish I could hug and say: “Thank you for saving me from me.” However, so compelling and possible was your article, that I had to comment! I have a long-term goal(up to a year) and short-term goals(up to a month). I like to plan tasks for the week. Sometimes I use the Pomodoro method to perform tasks. This approach is quite productive. To plan goals, projects, and tasks, I use iSmart.Life ( https://ismart.life ) app. It is a very simple and free web app.